The non-profit Canine Companions for Independence is looking for volunteers to help at events, raise puppies, or simply donate so they can fulfill their mission of giving a dog a job and providing independence for their community members. -Service dogs assist adults with physical disabilities by performing daily tasks. -Hearing dogs alert their partners, who are deaf and hard of hearing, to important sounds. -Facility dogs work with clients with special needs in a visitation, education, criminal justice or health care setting. -Skilled companions enhance independence for children and adults with physical, cognitive and developmental disabilities. The dogs are provided to qualified recipients at no cost to them. The dogs are trained by volunteers for the first 18 months of their life, then they go to training at the non-profit's Oceanside campus for six to nine months. Then, it's graduation day. 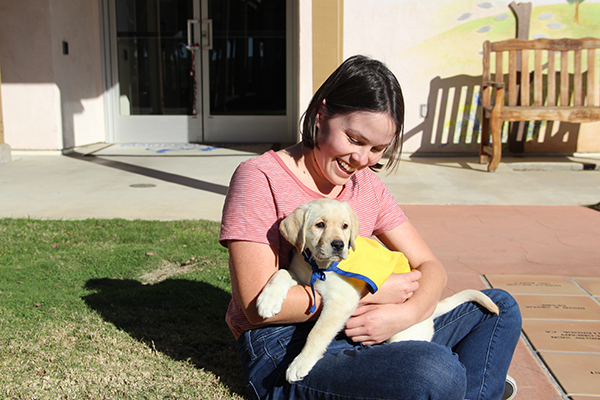 For Puppy Raiser and Kennel Technician Emily Miranda, the idea of letting go of little Napa is rough. "It'll definitely be hard, I already know that it will be even though it's still a year and a half away, but I know it's going to be for a good reason," said Miranda. Miranda has had the blonde 10-week-old pup for two weeks and is already modifying her schedule to work better with Napa. Miranda and her coworkers know these dogs serve a higher purpose. "I see it every day and it really is a miracle, these people really get enhanced independence and you can see them light up and their worlds change when these dogs come into their lives," said Stacy Haynes, Public Relations and Marketing Coordinator with Canine Companions for Independence. Check out the article on the 10News website here.